The technology in a new collaboration space at the University of Missouri College of Education is enabling faculty and college students to reach out remotely to the state's schools to help combat bullying. 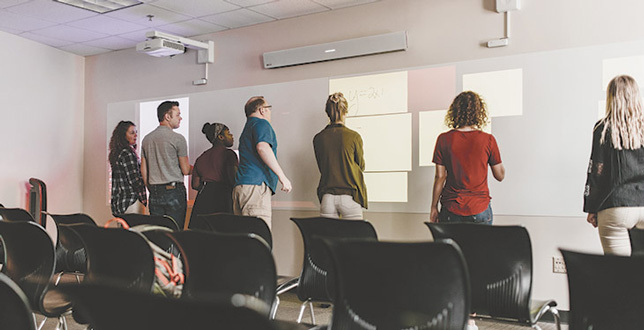 Recently, the institution implemented display and audio systems from Nureva in the classroom, which has been designated the "Nureva Collaboration Room." The room now includes the wall-length Span System, a cloud-based canvas that allows users to interact with content on the display as well as on their own devices. Up to 20 users can simultaneously create, edit and organize contributions to the project. The workspace can be expanded up to 200 feet in length, though the University of Missouri space uses a 20-foot long display. The classroom also has Nureva's HDL300 audio conferencing system with 8,192 virtual microphones or, as the company refers to it, "Microphone Mist." The setup uses algorithms to process sound that's coming through 12 omnidirectional microphones built into the physical microphones in the HDL300 system. The objective: to enable any sound to be picked up and transmitted to those listening from another location. According to the company, the application works with multiple conferencing systems, including Zoom, Skype for Business, Blue Jeans, Cisco Spark and WebEx and GoToMeeting. The layout is intended to allow faculty members to try incorporating technology into their instructional practices and give students the chance to work together. But according to coverage on the university website, an associate professor in the Department of Special Education has found a different use: the Bully Prevention Lab. Chad Rose is working with graduate and undergraduate students in developing programs and interventions to fight bullying. Rather than travel to schools around the state to help educators learn how to put the practices into operation, the team can have "hands-on, face-to-face-like interaction" through the Nureva gear. For example, recently the Lab team met remotely with a seventh grader who wants to start a project at his school to help middle schoolers become a liaison between bullied kids and counselors. According to Rose, the technology will make his team more efficient and set up a collaboration between higher ed and communities that want to stop bullying. "No longer do we have to have schools carrying the load of bully prevention," he explained. "Now what we can do is say let's enter into a partnership, where bullying prevention is part of our community, where we're all speaking the same language, because the issue of bullying impacts us all." "It has just been incredible to see how both of the Nureva systems have inspired new ideas and solutions related to teaching and learning while reaching new audiences that have been limited by geography, finances or human resources," added Kathryn Chval, the College of Education's dean, in a press release. "We have generated an astonishing number of possibilities to use this innovation, and the impact will be extraordinary."